Of course she was right about a lot of things, but, two things in particular have had my attention lately. First, she was absolutely, positively correct when she said I looked better with short hair. Which was exactly the kind of pronouncement that fed my reactivity as a young woman and kept my hair long for way longer than it should have been. Some women look marvelous with long hair. Emmylou Harris, Goldie Hawn, Meryl Streep and my dear friend Tina Bennett can carry it off marvelously. Me, not so much. After fighting it forever, I am happily wearing my hair short and I know my mom is somewhere smiling. She never said I told you so, but, I'll give her this one. "Yes, Momma, you were right about the hair." The second thing that she was right about has had a profound impact upon my life. It was really quite simple, she never failed to say, look it up, you'll remember it that way, whenever I asked her to tell me the meaning of a word. It used to aggravate me to no end, but, I learned much more than how to look up words in the dictionary. I learned to take responsibility for my learning and to love finding the answer to simple and complex questions. I can't help but, believe that my mom would be delighted to know that her simple lesson blossomed into a life long love of learning that eventually led me to wildflower gardening! Which is ironic when you consider how very much she detested gardening. (The Faux Gardener) I know that she is somewhere laughing with her sisters about the lesson she no doubt learned from her mother and passed on to me. She was a wise woman, although it took me most of my life to realize how incredibly amazing she was. 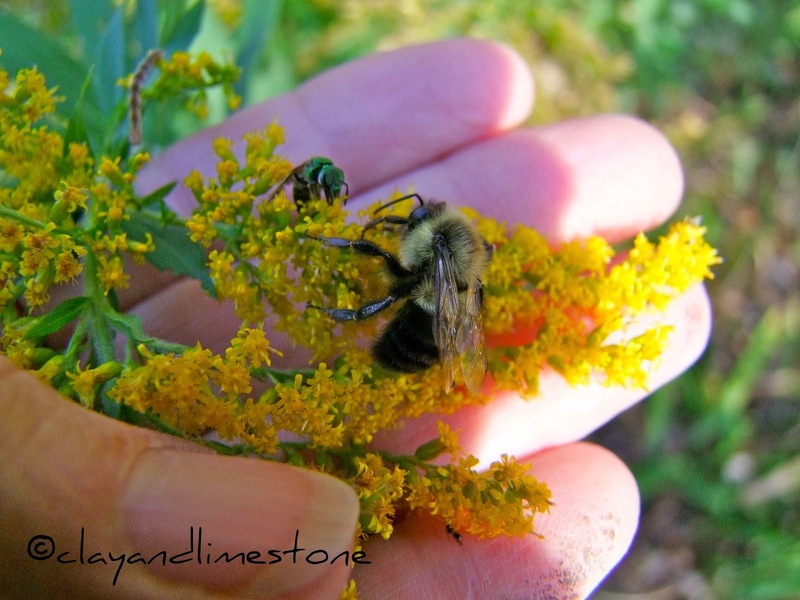 I am forever grateful for her look it up yourself lessons and all that it has brought me~gardening, a deep connection to the natural world and garden friends all over the world. There is just one thing I want you to know... I love when you ask me to help you identify wildflowers! You must never, ever worry that it is a bother. It never is... I love the hunt and I especially love discovering the answer. Besides, I almost always get to learn about a new wildflower that might be happy in my garden...So, maybe, I need to thank you! PS All flowers are Gaura lindheimeri cultivars (native to Texas and Louisiana), except the last which is Gaura filipes, a native toTennessee and a few other states. Lucky are the kids that think mom is right sooner than later. I love your short hair and It's always nice to know you're available for wildflower id. I saw one unfamiliar to me at NC Botanical Gardens at Chapel Hill yesterday and thought, I'll bet Gail know that one. H.
What a lovely story, dear Gail! I loved hearing about your mother's advice, and your reaction to it. Of course you wore your hair long when she would say that. Your hair is lovely long or short, IMHO. But your mother's advice to look it up yourself is the gift to last a lifetime. You are my go-to for identification of wildflowers and also wildlife. For that, and your friendship, I thank you from my whole heart. Gail, that's a delightful tribute to your mom. Your readers, fellow bloggers and friends are all grateful to her for helping to make you the wonderful woman you are! What a nice post to wake up to...I loved the background and the lesson in it. I'm sure your mom is laughing (as you said) but also happy that she was able to give you this gift. Wonderful tribute to Mom. I am sure she is happy it is in print. I think I have only seen you with short hair. You look great. Thank you. It's even a bit shorter now, but, I am growing it out to Bob length this winter. Mine is also a Look it Up for Yourself mother. But how different life is with Google, my mother always longed for an Encyclopaedia Britannica, and I would have loved the full 20 something volumes of the OED - and a library to house them in. What a wonderful tribute to your mom! I'm glad you didn't wait for Mother's Day. This is a wonderful tribute to your mom, and I appreciate her wisdom, especially about looking up answers for yourself. Lovely guara - one of my favorites! And wise advice, too. I don't know if I'd be as willing to look plants up if I had to go to the library - the internet with all the images available makes a HUGE difference. I love the library, and books, but plant id for me requires lots of different images. Wonderful post! I love gaura and short hair, too. I haven't had long hair in a long time and enjoy how much cooler shorter hair is. Your moms sounds wise. Hi Gail, What a sweet post in tribute to your mom. I remember when we first "met" after you began blogging (and I hadn't done it long myself) and you had purchased a Witch Hazel in honor of your mom. Happy day, blogging friend! I am tickled pink that you recall that Kathy! I named the witch hazel Bernice, so it's Hamamelis vernalis 'Bernice'! Those Guara shots are the perfect backdrop to your masterfully crafted prose. What a lovely tribute to your mom! My mom said the same thing, about hair and lessons. I used to be soooo mad when I just wanted to know and was given the answer "go look it up". I seem to recall repeating the same words to my kids. Age old wisdom. Traced your links back to the prior Bernice stories - it helped me appreciate you even more, short or long haired though you may be from time to time. Just FYI, I was brought up by grandparents who owned (and thoroughly read) an entire set of Encyclopedia Britannica. Was also taught to look it up, and to have a deep appreciation for words and the knowledge and music they contain. Ah the lessons we learn from our parents...my parents made sure we had The World Book so we could look it up...I still do but now it is online and in books...love the gaura.. Your mother sounds like a wise woman--a lovely tribute to her, Gail. I must have been somewhat of a trial to my mother when I was growing up; I know I didn't appreciate her the way I do now. But I learned as an adult that my mother knew a lot more than I gave her credit for:) I think she's pleased that the girl who used to grumble about having to help her in the vegetable garden is now so passionate about gardening. Your gauras are so beautiful! Sadly, I've never been able to get one to survive here. I forgot to add--your mother taught you a great lesson when she advised you to "look it up." And in our day, that didn't mean grabbing our smartphones or tablets and googling it--we actually had to get up and find a BOOK to locate the answer! Wonderful, absolutely wonderful writing! The same about your pictures, Gail, but I would enjoy this post even without the pictures. I should say 'Look it up...' more often to my boys! Thank you! Because we don't have ready reference for our wildflowers, i ask my mother too for their common or local names. Sometimes it gives me the lead in getting their scientific names. I love the colors of your posts now, and i think that is exactly the plant which signify the meme for Wildflowers. I love Guaria, and it's yet another plant that I didn't plant this year, what a shame....spring kind of crept up on me, new place and all. 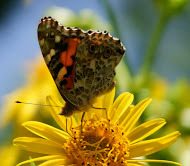 Gail, your style of photography is amazing, and the way you shoot insects always inspires me to try harder. A lovely story indeed and I know I appreciate all your help with identifications. I think your short hair looks great too! The PPS meeting is the 16th-so one week from this Tuesday. Don't go the wrong nite:) I've actually done that before driving all the way from my home to Cheekwood. Not good at all. I wonder if our mothers were related - mine also disliked my long hair and always told me to look things up for myself. Even though she was raising four children on her own, she bought us the World Book Encyclopedia. I remember choosing a volume to take to bed with me each night. I'm still wearing my hair longish, but braided, usually, which would make her somewhat happier. I love your photos and your writing. Your blog is beautiful. I had to laugh when you said your mom said you look better with short hair. My mom is 80, and has always liked my hair short. In fact, I was not allowed to grow it out until I was on my own. Over the years, I've had it different lengths. Right now, it is a couple inches lower than my shoulders. I like gauras, but they only live a few years here. I don't think I've found a native kind. Thank you for being willing to help us identify our mystery plants.